Already making its rounds on the interweb, the parasitic network object, dubbed Wifi-Liberator, is gaining momentum. Currently in a 1.0 stage, the Wifi-Liberator takes advantage of pay-per-use wifi zones, by opening up one paying node to multiple other nodes for free internet usage. "The project is presented as a challenge to existing corporate or "locked" private wireless nodes to encourage the proliferation of free networks and connectivity across the planet. ...the Wifi-Liberator critically examines the tensions between providers trying to profit from the increasingly minimal costs associated with setting up a public network and casual users who simply want to see the Internet transform into another "public utility" and become as ubiquitous and free as the air we breathe." 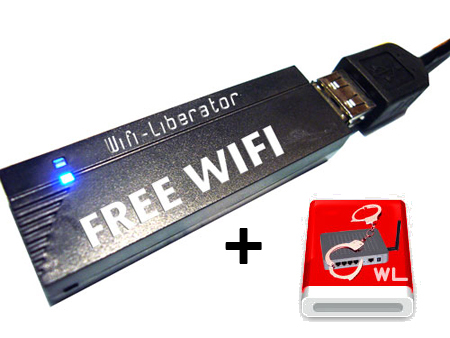 Currently, the Wifi-Liberator is only set up to work if the user shares their connection, as opposed to keeping it for themselves.